A recent article in a “newlywed” magazine (disclaimer forthcoming) which my wife subscribes to, asserts the trend that youthfully aged newlyweds meet and mingle with other youthfully aged newlyweds; the reason being that couples desire having those friends whom they can go camping with, go out on the boat with, etc. When our 40 something married couple neighbors were recently replaced by what appeared to be 20 something newlyweds, we knew we had to capitalize on this potential newlywed vs. newlywed friendship. We opted for a Holiday Style meal, which occurred Monday night. While awaiting the first delivery on our Viticultural journey (A Whidbey Island White), my wife and I had to scramble for a quality red to compliment our inaugural meal. We’d planned a flank steak, paired with Asian Noodle Salad and a Red Rosemary/Italian Seasoned Potato Dish. Believing first impressions are everything, no chances were taken on the wine selection, opting for that “sure thing” I knew would represent us well. 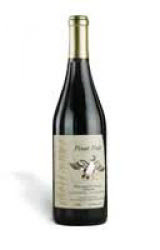 I chose, dare I say, an Oregon Varietal, Duck Pond Cellars - 2006 Pinot Noir. Before I’m berated by my fellow bloggers, let it be known that Duck Pond Cellars utilizes Washington land for a good portion of their harvest. The Pinot family of grape, however, is grown in the Willamette Valley. Fellow Oregon Wine Blog Staff Member, Josh Gana, and I, had the pleasure of enjoying a tasting session at Duck Pond Cellars a few years back (2005). I remember leaving the session thinking their Gewürztraminer was good, but their Pinot Noir was great. I used a couple tablespoons of the wine as a portion of the marinade I’d produced for the flank steak. Letting it marinate 12 hours, I was hopeful our main course would be a treat. Of course, having popped the cork, I couldn’t resist my first glass. The wine glistened in the glass, showing off a purplish, more ruby colored texture. A swirl gave evidence to a thin mix, to some dismay. The nose offered a youthful aroma of cherry and berries, some of which I had difficulty pin pointing. The wine provided a balanced, smooth collection of flavors, while slightly light bodied. The finish was shorter than I prefer. Had I had it over, I would have preferred a more robust wine as a marinade, possibly a Cabernet Sauvignon. In the context of conversation, tasting enjoyment, and making new friends, this Pinot Noir was no let down, while a little less enjoyable than I remembered back in 2005. And yes, as you’ve figured, I do read articles in “girly” magazines! Inaugural Holiday Pairing Guide - COMING SOON!